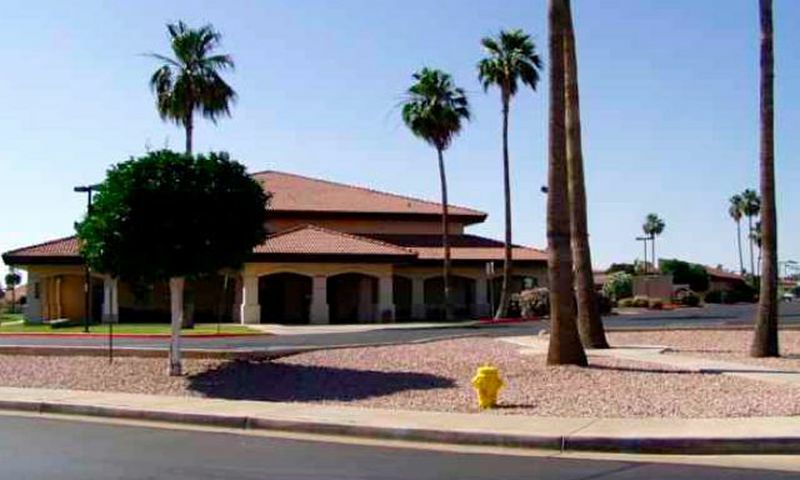 Sunland Village East in Mesa, Arizona is a well-established 55+ community in a great location. The community offers a wide array of social activities and clubs. The older homes of Sunland Village East are perfect for home buyers seeking lower priced homes and minimal association fees. Sunland Village East is located at the corner of Baseline and Sossaman Road near the intersection of the Superstition Freeway (60) and the Santan Freeway (202). The established suburban location near many retail and dining outlets is preferred by buyers who favor a good location over rural new construction communities. The amenities at Sunland Village East include two clubhouses featuring a fitness center, restaurant, hobby rooms, woodworking shop and more. Outside, three pools, six lighted tennis courts, bocce ball courts, shuffle board courts and the 18-hole Sunland Village East Golf Course beckon to the community's residents to get out and be active. Homebuyers can choose from resale single-family and town homes. The homes in Sunland Village East were constructed between 1984 and 1994. Although the floor plans are somewhat dated, they present a great bargain for home buyers who want reasonably priced square footage in an established community. The home prices are lower than many newer communities and the contribution of resident volunteers insures that association fees remain reasonable. A calendar full of events, group meetings, classes and activities is continually provided to the residents of Sunland Village East. Known for its incredible volunteer population, there are plenty of helpful services available in Sunland Village East that contribute to the community's close-knit feel. Sunland Village East is located in Mesa, Arizona. Here residents live close to everything they'll need within a welcoming community setting. This active adult community enjoys views of the Superstition Mountains with a close proximity to the five Salt River lakes, just 20 miles east. With Boyce Thompson Arboretum State Park, Canyon and Sagure Lakes, and Usery Mountain Regional Park all nearby, there are many recreational activities that can be enjoyed throughout the year. In addition to outdoor activities, Mesa Arts Center, Gammage Auditorium, and Chandler Museum of Arts host events throughout the year for cultural and educational opportunities. With so much to inside the community and throughout Mesa, it's easy to see why Sunland Village East is a great community for Central Arizona's active adults. There are a variety of amenities throughout Sunland Village East. Below is a list what you'll find throughout the community. The North Complex is the main amenity center where most of the community activities take place. Below is list of what you'll find here. There are plenty of activities available in Sunland Village East. Here is a sample of some of the clubs, activities and classes offered here. Attached homes throughout Sunland Village East have either golf course or garden views. They are single-level homes that range from 1,000 to 1,623 square feet in size. These low-maintenance homes feature one to two bedrooms, two bathrooms, and a one or two-car garage. Single-family homes throughout Sunland Village East range from 1,110 to 2,155 square feet. These homes are ranch-style and feature two to three bedrooms, two to three bathrooms, and an attached garage. Single-family homes are still low-maintenance but offer more privacy than an attached home. Extremely satisfied with SVE and the quality of their homes. Great amenities and friendly residents. More than enough to do. Cost of living is very appealing in Mesa. I'm pretty happy with Sunland Village East. I wanted something small and inexpensive in an established community. I am retired and spend lots of my days on the golf course or talking sports with the guys. I'm a pretty casual and laid-back person so this community has been great for me. Lots of nice people and a good neighborhood feel. 55places.com is not affiliated with the developer(s) or homeowners association of Sunland Village East. The information you submit is distributed to a 55places.com Partner Agent, who is a licensed real estate agent. The information regarding Sunland Village East has not been verified or approved by the developer or homeowners association. Please verify all information prior to purchasing. 55places.com is not responsible for any errors regarding the information displayed on this website.